Empowered by Nvidia’s latest graphics, Razer's latest Blade refines the platform into the veritable MacBook Pro of Windows laptops – an apt analogy end to end – perhaps out-doing even Apple this time. Over the past few years, gaming laptop makers have focused on looks around the screen just as much as they have on looks within the screen. 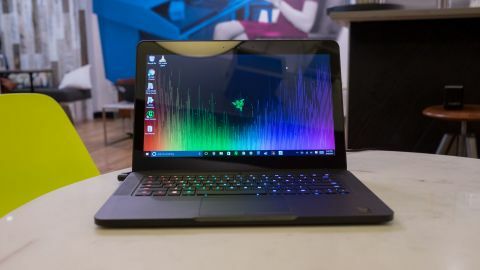 Naturally, Razer spurred this trend with the Blade, and while the latest updates to the laptop that sparked the trend are minor, they solidify its position as one of Windows’s best answers to the MacBook Pro. Nothing has changed visually about the new Blade since first review in 2016 in August, though some change has gone on inside, namely an upgrade to Nvidia’s GeForce GTX 1060 graphics chip. Is that worth an upgrade or making the plunge now? Many, even us, have compared the Blade to Apple’s MacBook Pro line in the past. With the latest changes to Apple’s leading laptop, that comparison rings true louder than ever. So, the Blade’s appeal to you relies just as much on its design as it’s ever have, perhaps even more so now with the latest Nvidia graphics stacked against the AMD chip used in the MacBook Pro. Nearly two months after reviewing the Razer Blade, we’ve stared directly into the eyes of not only its (expensive) powerhouse of a sibling, the Razer Blade Pro, but a three-screened monster known as Project Valerie as well. Though it was swiped from right under our noses in January, Razer showcased a glimpse of the future with a GTX 1080-enhanced laptop designed for 4K gaming across a trio of displays. What’s more, Razer has prototyped a projector concept that takes holograms to a whole new level, extending your gameplay beyond the screen of your PC to the walls of your living room. It’s only supported by one game, but overall, the thought of 100-inch 4K game projections is an idea that would have many gamers weak in the knees. However, if you want something more affordable from Razer, it has a new Razer Blade Stealth on offer as well. At first glance, the Blade’s design has gone unchanged in the past year. Since we last reviewed the Blade in August, that’s largely true. But even in these short months, Razer has managed to improve the chassis even further with some subtle changes. For instance, the Razer Blade is lighter than ever all over again: from 4.25 pounds (1.92kg) since the last revision to just 4.16 pounds (1.88kg) now. It’s tough to say whether you can feel the difference, especially since the Blade laptops have been historically thin and light. Not much, if anything, has changed about the Blade’s shell. It’s still built from a sheet of aircraft grade aluminum put through a CNC mill that’s anodized and coated in a slick black paint. All of the logos and buttons are in their respective places and look or feel exactly the same. Inside, however, Razer must have upgraded the logic board, as it made room for a USB-C port in addition to the existing three USB 3.0 ports. The device maker is also touting an improved thermal design with this Blade, which now supports an Nvidia GTX 1060 graphics chip. That said, this thermal upgrade makes using the laptop on your, well, lap while under heavy load singe a little less. Though, we find the fans to whir a little too loudly than we’d like when the system is under load. That said, it’s nothing the pair of gaming headphones you’re already using can’t alleviate. Razer has finally broke past Alienware and MSI’s laptops in introducing its Chroma lighting system for PC keyboards to the Blade, and maintains that lead with the latest Blade. Loaded with the same software that owners of Chroma desktop owners use, the keyboard sports all individually-lit keys that can display any of 16.8 million colors just like before. You can assign a unique color to each key on the board through this software, allowing you to highlight your most-used keys (i.e. WASD) or color code them for specific scenarios (e.g. in strategy and MMO games). You can save these assignments across profiles, and soon they’ll be playing directly into your games, should game developers adopt Razer’s kit available to them.